Like many dimensions of human behavior during the early phases of New World occupation, interpretations of Early Paleoindian subsistence practices are highly contentious. Different researchers examining the same faunal record have arrived at opposing conclusions regarding what Early Paleoindians were hunting, collecting, and eating. Some argue that Early Paleoindians were quintessentially “large game specialists;” others see a pattern of “generalized foraging.” This debate has important implications for evaluating possible causes of Pleistocene extinctions. 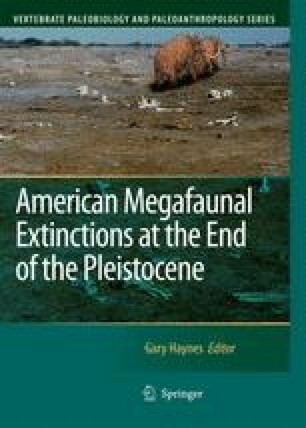 While at the core of the issue is a fundamentally simple question–“What did Early Paleoindians hunt?”–the interpretation of direct human involvement in the demise of multiple species of animals is clouded by larger issues concerning hunter-gatherer economics and climate change. Our concern is with the former, and we examine Early Paleoindian hunting from an ethnographic, zooarcheological, and behavioral ecological standpoint.